In the world of Hellboy, the immortal sorceress, Nimue, was once the Lady of the Lake. She was the one who gave Excalibur to King Arthur, which helped him reign in Camelot. But the centuries have not been kind to Nimue, despite her ageless features. She’s the mother of monsters, and her children have been devastated by humanity. Now, Nimue wants her revenge. But in a new preview scene from Hellboy, she sees even more possibilities. 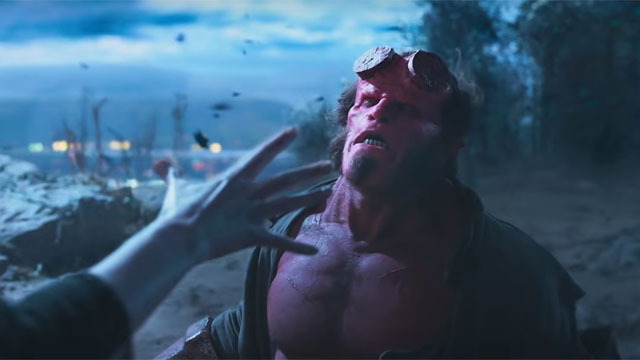 Within the clip, Nimue (Milla Jovovich) easily overpower’s David Harbour’s Hellboy. However, she’s not interested in destroying the world’s greatest paranormal investigator. Instead, she offers Hellboy the chance to embrace his true nature as the beast of the apocalypse. She even gives him the chance to rule the ashes of the world by her side as a king. Naturally, Hellboy isn’t simply going to give her what she wants. But even Hellboy feels alone in a world that’s clearly not built for him. Ian McShane co-stars as Hellboy’s adoptive father, Trevor Bruttenholm. Ex-Lost star Daniel Dae Kim is playing Ben Daimio, with Sasha Lane as Alice Monaghan. Thomas Haden Church is also in the film as the fan favorite vigilante, Lobster Johnson. Neil Marshall directed the Hellboy reboot from a script by Andrew Cosby. It will hit theaters on Friday, April 12. What do you think about Queen Nimue’s offer to Hellboy? Let us know in the comment section below!